As a person born in February, amethyst is my birthstone, and I've always been drawn to it. Whilst I was a young teenager growing up in the 80's, I was very interested in minerals and semi-precious gemstones. At one time I had amassed a rather sizeable collection of rocks - all of which I treasured for their value; both arcane and aesthetic. Ever since being introduced to Olivier Durbano's "Rock Crystal", I have anticipated trying the second in his series of seven stone poems: Améthyste. I was so taken by the phenomenal incense accord of his first perfume, that I had hoped it would reappear here. And I was not disappointed. Améthyste is another stellar interpretation of this deep violet variety of quartz. One certainly feels a sense of "purple" when smelling this for the first time. It opens with a delicate fruitiness where raspberry and grape beckon with one finger, before you are pulled down into a dry heart of rose-coloured palisander wood and orris root. As this scent develops, the blooming fruits recede and a puff of jasmine emerges that cartwheels across the composition before vanishing over an ambery, musky base. But it is the extravagant incense that lends its mineralic earthiness to this scent... it is as husky and dry as ancient sandstone that has been brushed away from a relic found in an archeological dig. It embodies the aroma of the earth that this semi-precious gem has been struck from. Like the stunning jewellery Durbano crafts by hand, this is a perfume to be treasured. 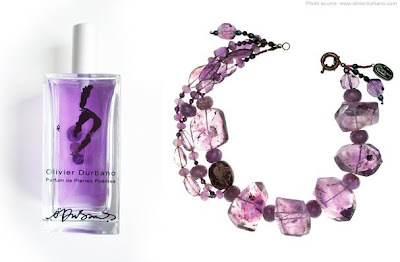 The bottle itself contains three genuine amethyst beads, suspended in the juice. As I turn the flacon in my hands and listen to the satisfying tinkle of the mauve orbs against the glass, I wonder if the liquid has imbued the stones with perfume, or, if indeed the perfume has been released by the stones. Loved your teaser image on Basenotes, Dimitri! I was beside myself, trying to figure out what your SotD was, until I actually paid attention to your mention of this review. Beautiful photo. Sounds like a VERY interesting scent. Thanks for the great description!